This is a collage I made last year. I titled it NEW DAY. I have been working on a new series and struggling a bit. I work in my studio during the day and often end the day frustrated and even feeling lost. The next day, in the early morning, I lie in bed thinking about the new day and what promise or hope I have for the new day in my studio. Every morning is like a haiku filled with new artists' impressions. I get up and get ready to tackle another day in my studio. Jo-Ann Van Reeuwyk is a fiber artist. Her work is about vessel making and containment. 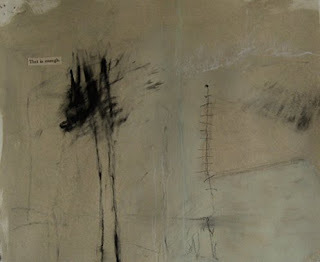 She explores relationships, embodiment and containment which are important aspects of the personal. 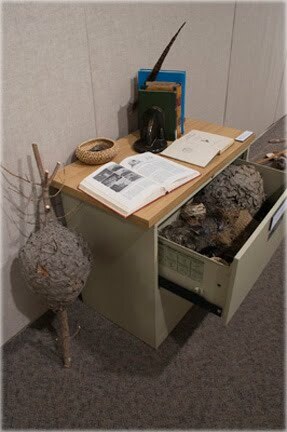 You can find much more of her wonderful fiber creations here. The following is a poem by David Whyte titled What to Remember When Waking. It is about what an artist (or poet in his case) thinks about when first awakening in the morning. 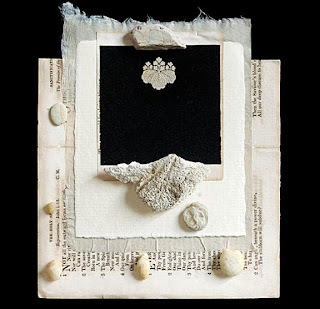 Carole Kunstadt is a collage artist who combines objects like stones, shells and twigs with hand made papers. 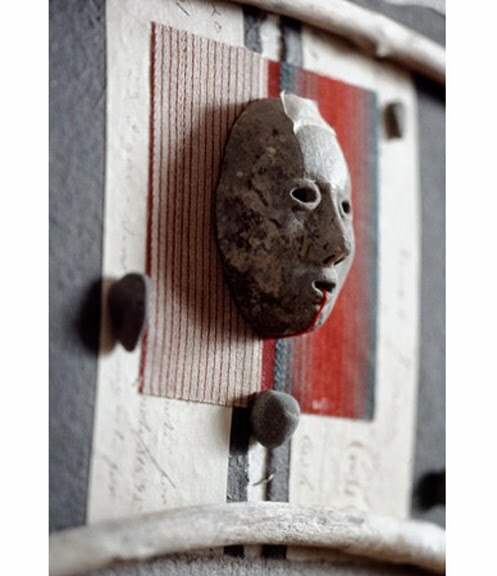 Layers of memory and a sense of intimacy pervade her work. You can find more of her wonderful work at her website here. 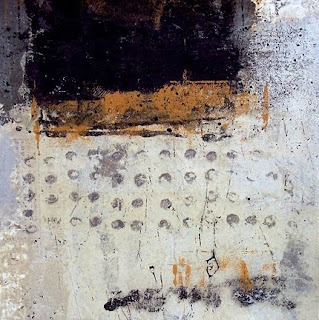 Tracy Spadafora is an encaustic artist who investigates the connection between our man-made and natural environments, illustrating the endurance of nature. These two are her works on paper and you can find more of her wonderful work at her website here. In the open and lovely white pages on the writing desk? 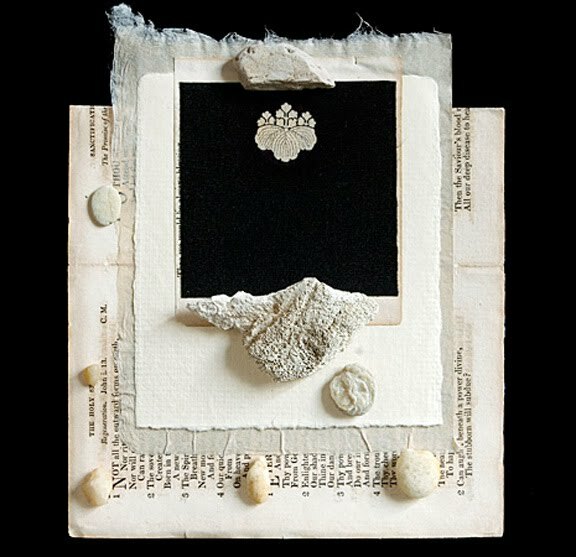 When I saw this collage by artist Leslie Avon Miller (you can find her wonderful blog here), I thought of early dawn when the sky is still dark but hints of color - orange, red, or yellow begin to burst through at the edge of the darkness - hinting at the new day.. a new day in the studio. I Like your collage very much. It's early in the morning here with me and your " new day" fits very well with my mood. Warm, cozy, not in a hurry,clear, excited to see what happens today. The other works you have shown are very interesting. Have a successful day, with beautiful new ideas. 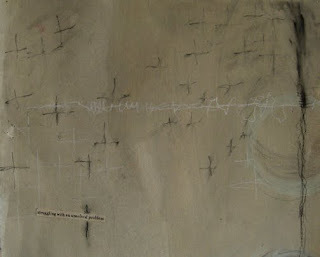 Wonderful art and words.....your blog is always so interesting. Donna, you have put this 'early morning feeling' so well into your words !!! wonderful art , wonderful links and words.... Enjoying your blog a lot ! Nice post as always. I'm looking forward to your new work. 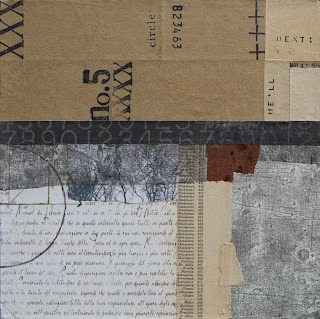 Donna, your "new Day"collage is stupendous, I do love some print or handwriting in a collage. Thank you for the introduction to the work of Carole Kunstadt, there is a surfeit of printed text in her work. j'aime beaucoup le nouveau site aussi! un travail de tout beauté! I'm not very awake in the mornings but I do sometimes have that special elusive thought, the trick is to remember it & then act on it. Practicing that is the fun/anxious part....it will come. donna, just seeing that you have a new post on your blog makes a good beginning for my day! this mornings treat is extra special thank you! Your work and that of Leslie I especially love. A very beautiful "NEW DAY"
Thank you for such an inspiring post and the introduction to some fabulous artists. As always, I'm inspired by your work and I was also inspired by your reminder of the newness of each day. The Navajo teach their children that each day brings a brand new sun and it lives only one day and in the evening passes on, never to return. The children are told that it is their responsibility to honor this sun that lives only one day by themselves living this day in a good way, so that the sun hasn't wasted its precious time. Inspiring as always, Donna. The poems; stunning and touching. And I take heart in a strange way to hear that artists, like you, whose work I admire and love also engage in struggle and experience frustration. Somehow this makes me feel less alone in this process. It is strangely comforting in some way. Does this make sense? It helps me relax into the process. And I hear you meeting it with such strength. And as always I look forward to exploring the treasures and treats you have layed out for us. Many thanks. Glorious images and poetry, Donna. I've just spent a wonderful few minutes browsing through Jo-Ann's website. Hope your new series flows easily!Can't wait to see what you are doing. Lovely post. Beautiful images and beautiful words! Thanks, you inspire my morning! Wonderful collage and an amazing selection of artists you've shared with us! Great inspiration! I find your work sensitive and also your choice of artists that you post. Wonderful! New Day is every day. We begin and begin again. Thank you for your sensitive combination of art and poetry. Donna - you have a wonderful way of presenting ephemera: both from the natural realm and the psychological. Somehow, it's comforting although the notion of transition and destruction is anything but comforting. Perhaps comfort comes from knowing that the power of the universe far exceeds our own and we are a small part of it. Donna--These are wonderful words from the poet you have posted here. They really speak to me, especially at this time, when I feel as though I have just awoken from a dream, as he talks about. Getting good news about your health really gives a person a boost and makes me keenly aware of what is really important in life and the choices we have to make each day when we open our eyes. I see exactly what you see in Leslie's piece. What incredible work she does, as do you!! Thanks for all these links. I will be going there to check them out. This really resonates with me Donna. Thank you for these images and introduction to artists who are new to me, and for sharing your process. I especially enjoyed David's comment "Keep on pushing your work." Good advice to us all. You gave me a lot to chew on. The poem by David Whyte touched me. You are always a joy to me. well, where have i been? wowo! what beautiful pieces of art! It's usually a struggle to give birth to new work. 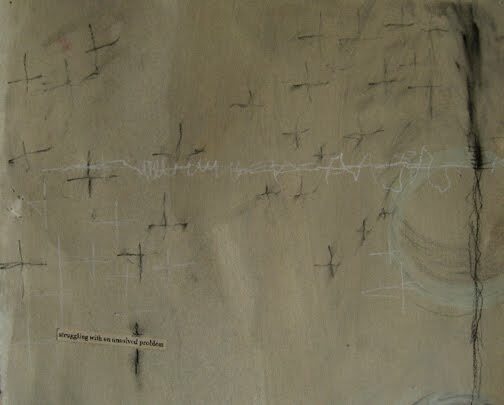 (Lately it seems my mantra in the studio is "I don't know what I'm doing, I don't know what I'm doing!) 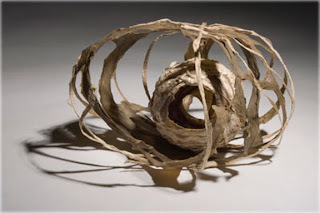 But I do trust the creative process and bear with the pieces that arrive unfathomly unformed! I like David Whyte's poetry. I have been to two of his workshops & he is an inspiring and energetic teacher. I don't think I've heard anyone recite poetry as well as he does. Thanks for posting all the links of the artists you posted. Looking forward to browsing. great post! beautiful "new day" and wonderful artists you show to us. 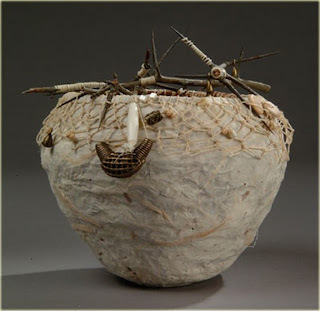 I'm a fan of jo-ann van reeuwyk and I love her creations very much. thank you for sharing! Donna, your New Day collage is fabulous. I especially love the dark middle section with the digits turning, like an odometer. the journey is always instructive. Donna, thank you for bringing my awareness to that moment of choice we have each morning. David Whyte's words and the pieces you've chose to share make it all the more eloquent. here in your world .. . . Your struggles in the studio have produced some wonderful work. Wonderful thoughts about morning. And i particularly love the pieces that you started and ended this post with!! Some wonderful inspiration here in your post. A terrific gathering. Leslie's collage looks so beautiful. More to inspect. Enjoy each new day. I am so moved by this poem, and the art that you share here, especially Leslie's and your thoughts about her piece. 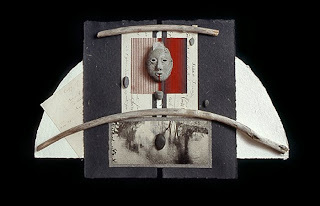 Nick Bantock told me once that your most creative time is in the morning between sleep and wakefulness.